Blacktown Hospital McGrath breast cancer nurse Michelle Rosano with oncologist Dr Matt Carlino. Hair loss in patients undergoing chemotherapy at Blacktown Hospital could be a thing of the past, thanks to a new machine, donated this week by the hospital’s auxiliary. Blacktown Hospital’s Cancer and Haematology Centre is the first facility in western Sydney – and one of few public hospitals in NSW – to house a Paxman Cooling Cap system for chemotherapy patients. The machine was this week installed in the cancer centre, courtesy of a generous donation by the hospital’s long-serving auxiliary volunteers. Blacktown Hospital auxiliary president Norma Hooper with volunteer Vera Barnes and Blacktown Hospital nurses Michelle Rosano and Leanne Everist. The treatment system uses a cold cap to cool the scalp, preserving a patient’s hair – and their self-confidence – during chemotherapy. 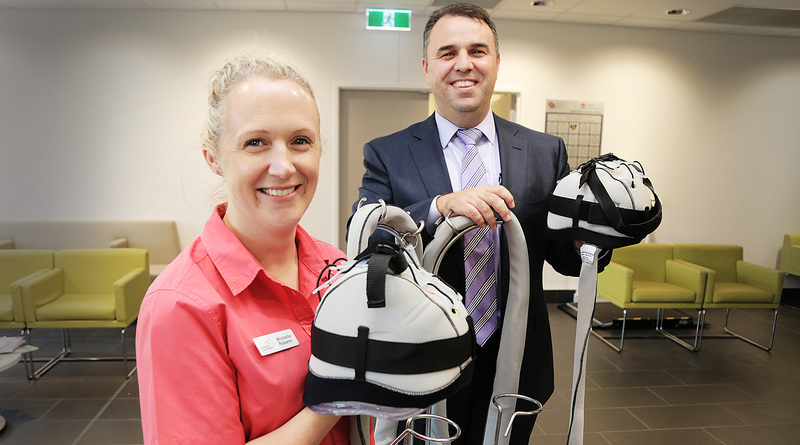 Blacktown Hospital Cancer and Haematology Centre manager Leanne Watson said the machine would be a game-changer for chemotherapy patients. “Hair loss can affect how a person feels about themselves and many patients are reluctant to have chemotherapy because they’re worried about losing their hair,” she said. The hospital’s cancer and haematology centre nurses are now being trained to use the machine, before it is available to patients later this year. Blacktown Hospital general manager Sue-Anne Redmond thanked the hard-working auxiliary for donating nearly $43,000 to fund the machine. “We are so grateful to the auxiliary – we know many members are cancer survivors so they had a personal connection to raising funds for this piece of equipment,” she said. Blacktown Hospital nurse Leanne Everist with volunteers Kay Cunningham, Vera Barnes, auxiliary president Norma Hooper, volunteers Margaret Bacon, Jenny Doak, Barbara June, Beverley Beaver and Kushma Presad, with cancer care co-ordinator Debra McDonald and nurse Michelle Rosano. The auxiliary also recently donated a bladder scanner, worth $8700, to the hospital’s cardiac unit. Since its inception in 1959, the auxiliary has funded more than $750,000 worth of equipment.